Frostival a fun-filled night celebrating the opening of The ICE at Discovery Green powered by Green Mountain Energy Company as well as the debut of the winter art installation, Hello Trees! The annual event will also feature ice carving by Reverend Butter and DLG Ice Factory, live music by The Peterson Brothers, and more. 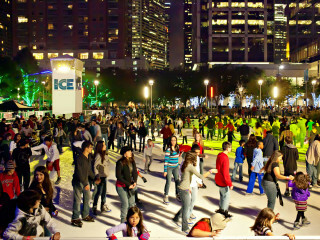 With a $20 contribution to Discovery Green Conservancy, guests will receive a hand-carved stein made of ice at the beer garden. Saint Arnold Brewing Company will fill it with root beer or a great locally crafted beer. A limited number will be available on the day of the event, so anyone interested is encouraged to donate ahead of time via this link.